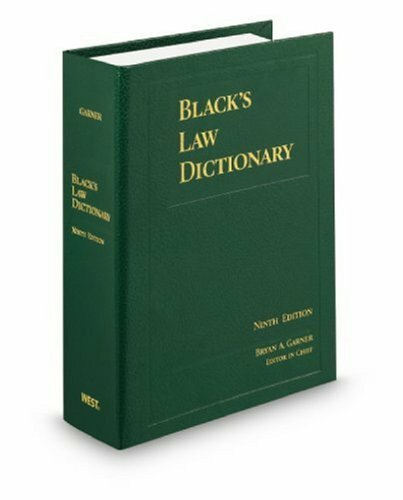 [PDF] Black's Law Dictionary, Standard Ninth Edition | Free eBooks Download - EBOOKEE! Posted on 2018-01-13, by luongquocchinh. Description: For more than a century Black's has been the gold standard for the language of law. Today it is the most widely cited law book in the world. Edited by Bryan A. Garner, the world s leading legal lexicographer, the 9th Edition is the most authoritative, comprehensive law dictionary ever published. It contains more than 45,000 terms and includes: 2,000 more terms than the 8th Edition and 19,000 more than the 7th Edition including click fraud, Code Adam, collaborative law, ecoterrorism, environmental tort, friendly subpoena, happy-slapping, honor crime, secret detention, Schumer box, and super precedent. The date when selected terms were first used in English-language contexts, especially in judicial opinions. Heightened accuracy having more than 200 lawyers around the country reviewed terms. Definitions of more than 1,000 law-related abbreviations and acronyms. Almost 3,000 quotations drawn from sources over five centuries. Alternate spellings or equivalent expressions for more than 5,300 terms and West Key Numbers. No comments for "[PDF] Black's Law Dictionary, Standard Ninth Edition".